LG 32 L Convection Microwave Oven (MJ3283BKG, Black) comes with good features to facilitate easy cooking at home. It has 32 liters of capacity that is really huge room for placing larger food items, large plates and other food packets. LG MJ3283BKG has awesome features such as Indian bread basket, light wave technology, charcoal lighting heater, motorized rotisserie, and child lock, 900 watts of power, one year warranty and required accessories. 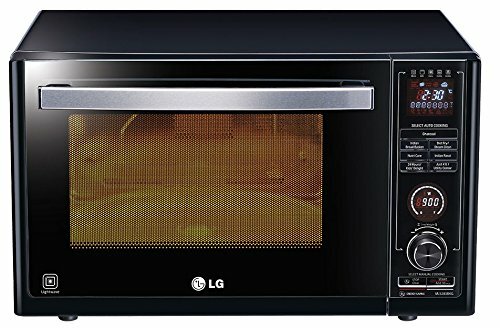 On the purchase of this LG MJ3283BKG microwave oven, you get accessories such as rotating ring, keep moisture keep glass, roti bar handle, multi-cook tawa, shelf, a cook book and a user manual. This LG microwave oven uses world’s first charcoal lighting heater that enables you to cook with an advanced charcoal filament for delicious, all natural, and deep even cooking without wasting too much time. Further, it uses light-wave technology that offers a multi-heating system that is perfect to cook healthy food at home. Cooked foods retain its natural flavors. It cooks dishes, which are crispy and juicy. Also, it comes with Indian Roti Basket that lets you prepare numerous exotic Indian rotis very easily. Indian Basket Roti has a wide varieties of recipes so that you can easily prepare tasty naans, lachacha pranthas, tandoori rotis, thepla, missi rotis and many other types of rotis very easily.